Noteworthy By Jen: Book Review: "Classroom Management for Art, Music, and P.E. 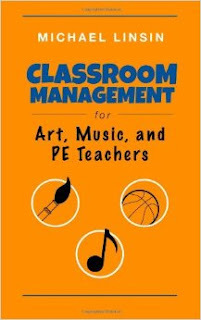 Teachers"
Book Review: "Classroom Management for Art, Music, and P.E. Teachers"
A little over a week ago, I wrote out some of my summer goals, and though I still have 3 days of school left, I’ve already accomplished part of my summer bucket list! I just finished reading “Classroom Management for Art, Music, and P.E. Teachers” by Michael Linsin. In two days. 1. Every new music teacher should read this book. It expresses much of what I have learned over the past ten years of teaching. 2. Michael Linsin, though a P.E. teacher, points out many of the realities of teaching music and how they differ from a classroom teacher. It’s nice to hear from someone who can relate! 3. His approach is calm and respectful to both the teacher and students. This is paramount to me—that my students feel they are treated fairly and with respect. 4. Experienced teachers can benefit from it too. It’s always good to hear someone else’s approach to teaching in a specials classroom (I say specials because of how it’s scheduled, but please know that I consider music to be a core class). You may learn some new tricks, or you may just enjoy hearing someone else chime in to say that what you’ve been doing is a good idea. If your class hasn’t quite been doing what you want, check it out! It’s a short read and you will likely find some helpful tips :) Catch you next time I have something noteworthy! Please note: Noteworthy By Jen is an Amazon affiliate. Links may be monetized to help pay for the upkeep of this blog.